Yesterday, ASUS’s entire Z87 motherboards lineup was leaked which can now be seen here. 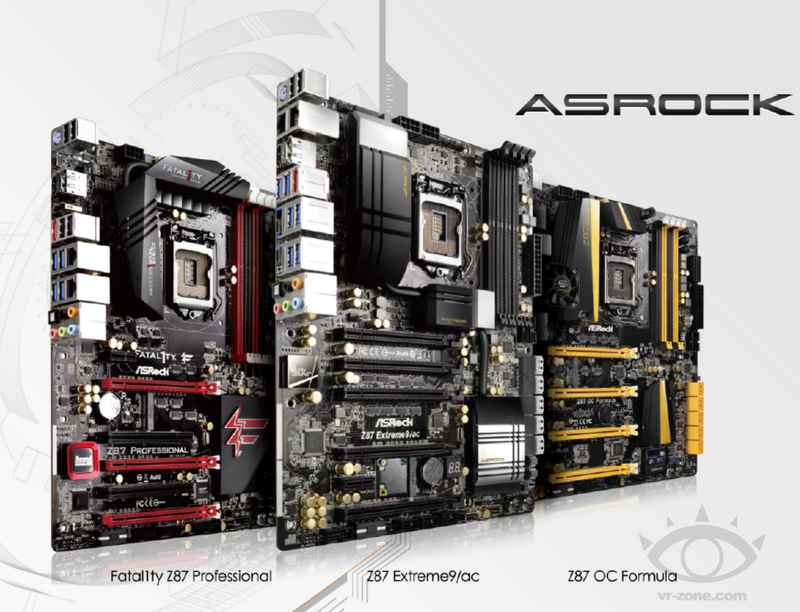 Today, thanks to VR-Zone we have got a first look at the Z87 motherboards lineup from manufacturer ASRock who are also preparing a neat list of products for the upcoming Haswell launch on June 3rd. 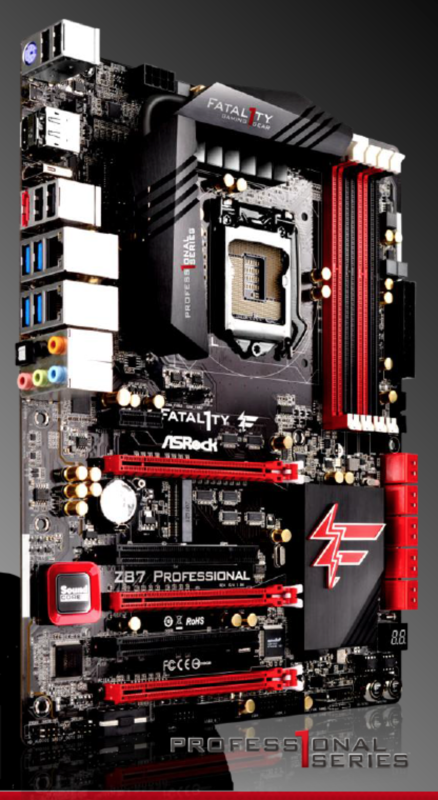 ASRock has divided their Z87 motherboards into three tiers – Z87 Formula, Z87 FATAL1TY and Z87 Extreme. Each tier comes with their own distinctive line of motherboards that are packed with various features for overclockers, gamers and enthusiasts. The ASRock Z87 professional is a high-end motherboard which packs an impressive red/black color theme and a set of nice looking heatsink including heatpipe cooling solution. For storage, the board offers 10 SATA 6GB/s ports while expansion slots include three PCI-e 3.0 x16, 1 PCI-e 3.0 x1 and 2 PCI legacy slots. The board includes Sound Core 3D that provides high quality and enhanced audio output through the 8.1 channel audio jack, dual Gigabit Lan ports and several USB 3.0 ports for connectivity options. The Z87 Professional also includes an M-PCI-e slot to support either mSATA SSDs or WiFI cards. The H87 Performance also falls under ASRock’s Z87 FATAL1TY tier providing a nice feature set for budget minded users. It comes with an 8-Pin connector that powers the LGA 1150 processors and has display connectivity options such as VGA, DVI and HDMI to run the 4th generation Intel HD Graphic chips. Storage on the board includes six SATA 6 GB/s ports while expansion slots include two PCI-e 3.0 x16, three PCI and 2 PCI-e 3.0 x1 slots.The H87 performance may be limited by overclocking features since it comes with a different chip that doesn’t provides most basic overclocking features to users. 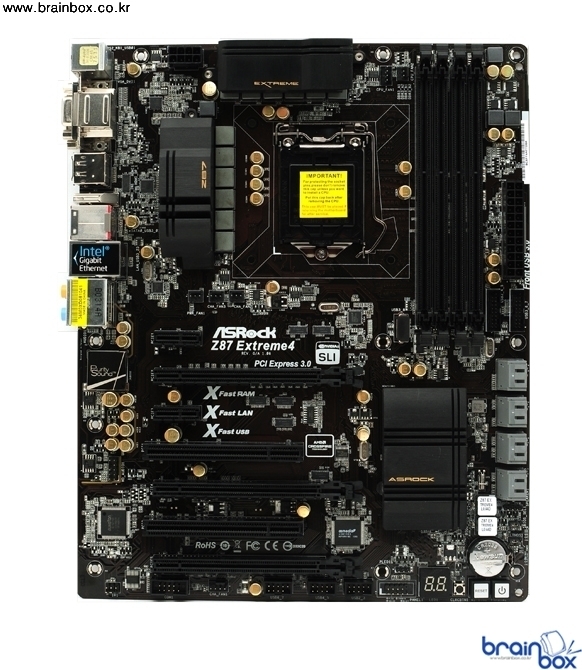 The board comes with ASRock’s A-PureStyle audio chip for high quality audio output. The Z87 OC Formula is ASRock’s highest tier board made specifically for overclocking professionals and enthusiast. 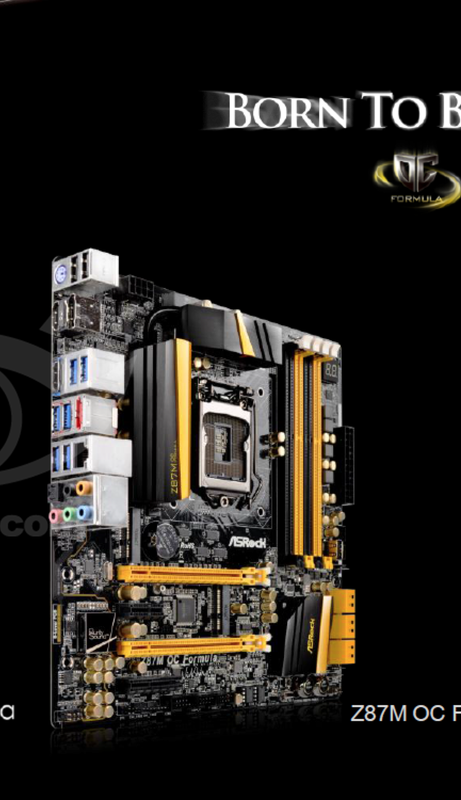 With its feature rich set of components and parts that include dual 8-Pin connectors to supply unprecedented power to the CPU socket, a black/yellow color theme including hybrid (Air + Water) cooling solution that sits on top of the electrical components making use of premium parts such as High C-Caps and a Digital PWM design. The Z87 OC Formula comes with the most amazing Debug LED system ever developed for motherboards with a fully visual interface that displays CPU temperature/voltage and more as seen in the picture. The design scheme is looks absolutely fantastic and has several overclocking features such as the already mentioned Debug LED along with Dual voltage measurement and OC switches near the DIMM slots. The motherboard makes use of four PCI-e 3.0 x16 slots and two PCI-e 3.0 x1 slots for expansion while 10 SATA 6GB/s ports offer storage. There’s also an onboard M-PCI-e slot while audio is provided through the high-quality Purity sound chip onboard. The Z87 OC Formula comes with HDMI for display and several USB 3.0 ports for connectivity. The main differnce between the Z87 OC Formula/ac and OC Formula is that the /ac model comes with an integrated 802.11ac network chip for wireless internet connectivity. 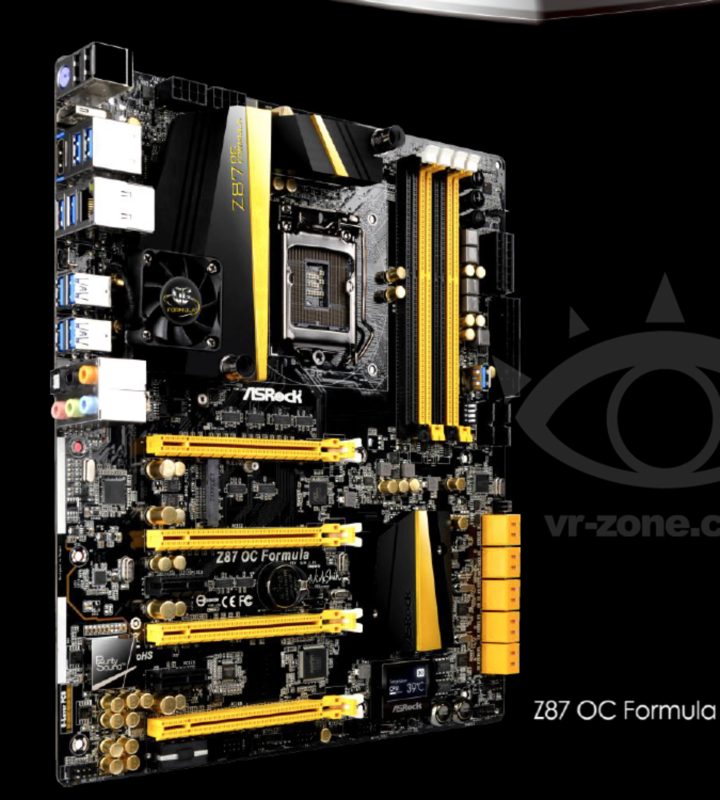 The ASRock Z87M OC Formula as the name suggests is an M-ATX variant of the Z87 formula with a few features left out. it maintains a yellow/black color theme and uses a heatpipe cooling solution, has 6 SATA 6GB/s ports, two PCI-e 3.0 x16, 1 PCI-e 3.0 x4 and 1 PCI-e 3.0 x1 slots. It uses a normal Debug LED and a few OC switches near the PCH heatsink. The I/O makes use of Display port and HDMI connector for display, Gigabit LAN and many USB 3.0 ports. It also uses ASRock’s Purity sound chip for high quality audio output. Pricing would obviously be a bit low compared to the Z87 OC Formula. The Extreme tier in ASRock’s Z87 motherboard lineup holds the most product, starting with the feature rich Z87 Extreme 11, Z87 Extreme 9, Z87 Extreme 6 and the mainstream Z87 Extreme 4 and Z87 Extreme M4 (M-ATX Variant of Z87 Extreme 4). A few motherboards have been detailed while the high-end Z87 Extreme 11 part is not revealed yet. The ASRock Z87 Extreme 9/AC just falls under the flagship Z87 Extreme 11 motherboard making use of a matte black and silver color theme. The heatpipe cooling solution runs from the VRM Phases all the way down to the PCH. The CPU socket is powered through Dual 8-Pin connectors and has the most basic features for overclockers. Expansion slots include five PCI-e 3.0 x16 and a single PCI-e 3.0 x1 slot while for storage there are 10 SATA 6 GB/s ports. It comes with onboard WiFI module and Purity sound chips for the best available experience. The Z87 Extreme 9 uses Dual Thunderbolt ports, HDMI, display port and several USB 3.0 ports for connectivity. 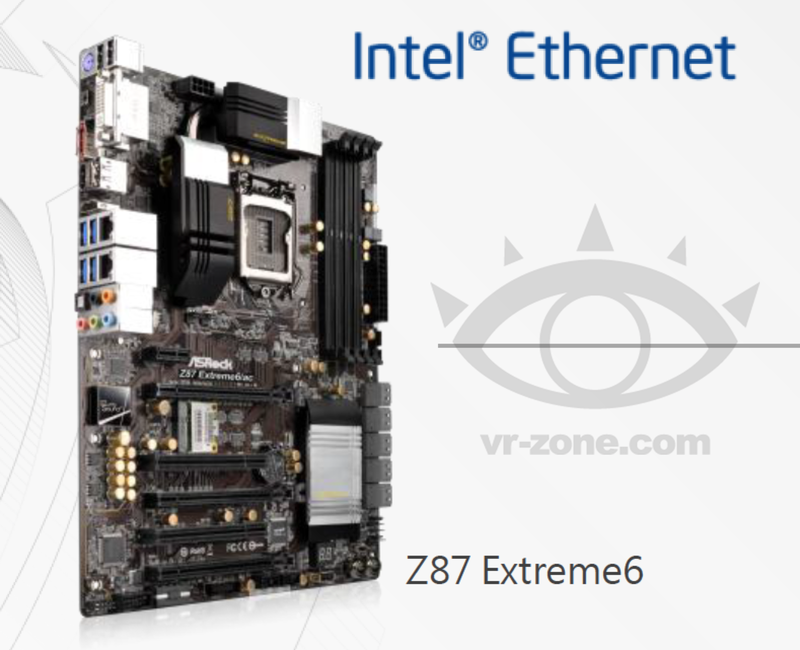 The ASRock Z87 Extreme 6 is the next in line of the Extreme series boards featuring a much more basic design compared to the Extreme 9 but still packs a nice set of features such as 10 SATA 3 ports, 3 PCI-e 3.0 x16 , 1 PCI-e 3.0 x1 and two PCI slots and onboard WiFi and PureSound modules. Brainbox, a Korean tech sites has a full review of ASRock’s Z87 Extreme 4 which can be found here. It has a basic design and an USB 3.0 on the motherboard which is quiet unusual. The Z87 Extreme M4 would the M-ATX variant of the same board with even more features missing but it would lower the cost down alot.